Mold and mildew are types of fungi; typically, mold is black or green, and mildew is gray or white. Mold tends to grows on food, whereas mildew is an issue on damp surfaces, like bathroom walls, basement walls, or fabrics. Mold grows in the form of multicellular filaments or hyphae, while mildew has flat growth. Mildew is often referred to as a kind of mold (or mold in its early stages), and is classified as powdery (under the order Erysiphales) and downy (under the family Peronosporaceae). Mildew is a specific kind of mold, usually with a flat growth habit. Mold is a fungi that contains multiple identical nuclei. It grows in the form of hyphae of filaments. Mildew could be downy or powdery: Downy mildew starts as yellow spots that first become brighter in appearance and then the color changes to brown. Powdery mildew is whitish in color and that slowly turn yellowish brown and then black. 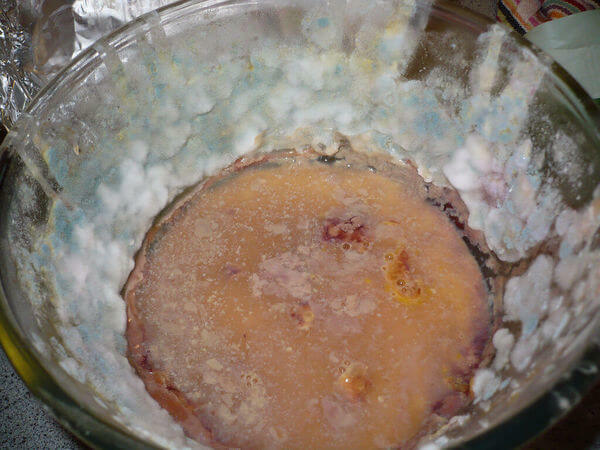 Mold has a fuzzy appearance and can be an orange, green, black, brown, pink or purple in color. Can be found in several shapes. None. Some molds are used in food production, for example, Penicillium is used in the production of cheese, Neurospora in the production of oncom, which is made from the by-product of tofu. To prevent mildew at home, keep all the areas moisture-free. There are mildew removers available at stores to eliminate mildew. To protect crops from mildew use mildew-resistant seeds, remove infested plants, avoid overhead heating. To prevent mold in your home, you need to keep all the areas dry and moisture-free. Check the humidity levels inside the house and take measures to control it. Finish perishable food within 3-4 days. 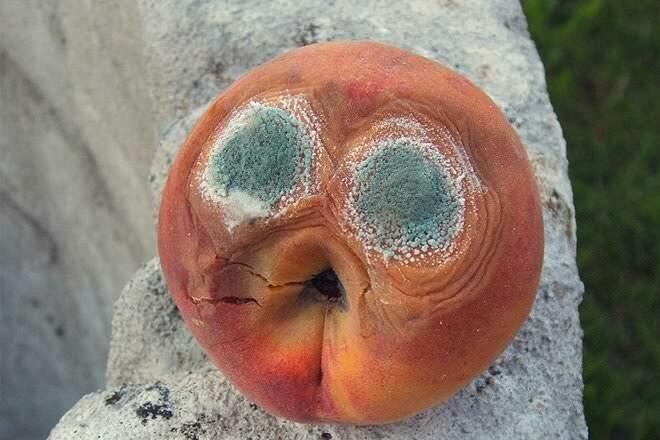 Mold has a fuzzy appearance and can be an orange, green, black, brown, pink or purple in color. Downy mildew starts as yellow spots that first become brighter in appearance and then the color changes to brown. Powdery mildew is whitish in color and looks like talcum powder. These white spots slowly turn yellowish brown and then black. Mold and mildew both produce gases that are sometimes odorless but sometimes can have a musty smell. The technical term for these gases is microbial volatile organic compounds, or MVOC. Sometimes you can detect the smell of mold even before you see it. The smell is unpleasant and dank, like wet socks or a damp forest with decaying wood. To get rid of the smell of mildew or mold, disinfect the surface using bleach or a mixture of water and vinegar. Be careful to wear rubber gloves. If you can smell the mold, it means spores are already in the air. Spores of fungi that produce mycotoxins are hazardous. For people who are sensitive to mold, it may lead to nasal irritation, stuffy nose, sore throat, skin or eye irritation, coughing and wheezing. This video explains the difference between toxic and allergenic mold (mildew). Some of the common mold genera include Acremonium, Aspergillus, and Penicillium, the latter of which includes a species (Penicillium chrysogenum) used in penicillin antibiotics. Examples of mildew include Peronospora sp, Blumeria, and Podosphaera. Some molds are used in food production. For example, Penicillium is used in the production of cheese, Neurospora in the production of oncom, which is made from the by-product of tofu, other molds in the production of bread, soya sauce and so on. 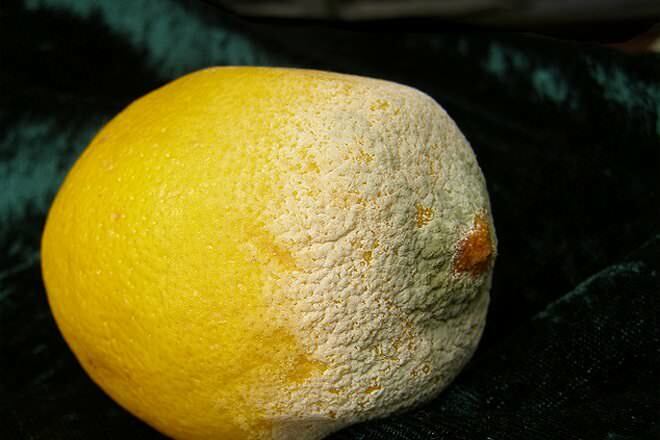 Mildew has no uses as such in food production. not really, anything that's moist will attract these (obviously if you read this). but why is under your bed so wet? planning on making a hot-tub? i found mildew surrounded by mold on my carpet under my bed. is this common at all?